Kyoto is one of Japan’s largest cities. For over thousands years it was Japan’s capital and emperor’s residence. During years, wars and fires destroyed the city. Nevertheless, it managed to maintain its glory. Due to its historical value during the Second World War, atomic bombs were not dropped on the city. And in 2014, it was recognised as World’s most beautiful city by ‘Travel + Luxury’ magazine. Kyoto stopped to be Japan’s capital not such a long time ago - in 1868. Not only was it a political center but also cultural one. Thanks to this within centuries diverse culture was blooming and developing in Kyoto like nowhere else. Uncountable temples were built during the time. Almost all the buildings remained until our times and it is still possible to admire their beauty. The city on three sides is surrounded by mountains and almost all attractions are located at their feet. The best time to visit Kyoto is in October when all the trees are turning red, yellow and orange. But in this period the city gets crowded as everybody wants to see the beautiful nature. Tradition is very important in the city. Nevertheless, current changes and progress didn’t affect the city too much. One of the districts where the tradition is present is called Gion. It developed thanks to nearby Yasaka temple. As pilgrims were coming many teahouses and restaurants were opened there, which in time changed to more fancy and elegant ones. In the district you can see geishas stalling on the streets. And only in Kyoto is possible to meet maikos - girls who are studying to become geishas. Kyoto is full of temples. 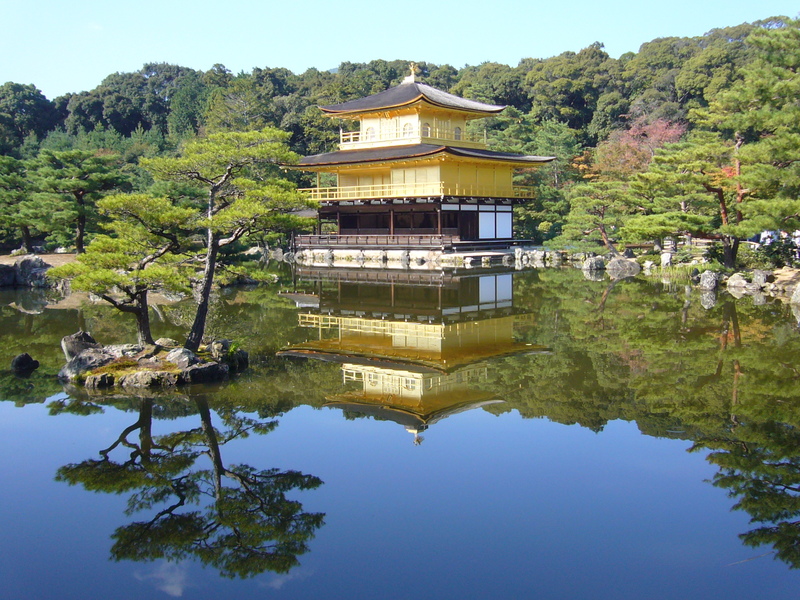 The most famous one is called Kinkakuji. The temple is covered with gold and located by lake. All the area around it is green and full of trees. So after seeing the majestic temple you can enjoy a walk in the gardens. Kyoto is famous for green tea. Being there you definitely should visit a teahouse. And at least once you take part in tea ceremony. You will learn there about tea history in Japan and see the precise and unique way of brewing tea.